I invited my former pastor to share her green craft ideas for spiritually connecting with the holiday season in a series of guest posts. Enjoy! a flexible outer “wreath” of wire and vintage buttons. This wreath drapes around the candles and herbs and is created with a 3:2 pattern. It can be used as a meditation tool with even the very young; the three button pattern representing “faith, hope & charity” or other centering words and the two button pattern representing the light and the humanity within each one of us. The inner “wreath” of wire and buttons is wrapped around the Christ Candle and also can be a meditation tool: the red button represents all who suffer in our world, the blue button represents Mary, the mother of Jesus, the wooden button represents Joseph, the father of Jesus, the luminous metallic button represents the mystery of love, the yellow button represents the birth of the “child of light.” A few additional buttons have been added to the inner wreath which can serve as reminders of prayers for specific loved ones or other concerns on the heart. The bundles of organic herbs: rosemary, lavender and thyme can be handled and rubbed to release more aromas, and even used for cooking. 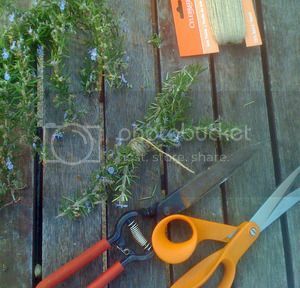 As they dry additional aromatic clippings (such from a branch of a Christmas tree) or other natural objects (leaves, feathers etc) can also be added to fill in and personalize the wreath. Advent starts this year on December 2. Begin the season by finding a home for your wreath. If you have children (old enough not to knock over the candles!) you might place it on a low table in the corner of a common room. The center of your kitchen or dining room table is also a good option. If you have a dark blue cloth/runner (the color of hope and waiting) you can drape it over the table. As the weeks go by a sense of expectancy and anticipation grows as new elements enter the scene. Each week we focus on different elements of our environment: mineral, plant, animal and human as well as centering on the four traditional Advent virtues: hope, love, joy & peace. In week one place beautiful stones and crystals around the wreath and light the first candle as you focus on “hope,” the foundation of our spirit. In week two add small greenery to the house, mantle, and table. This is a great week to bring in a Christmas tree and take a quiet moment to light again the first candle and add the second candle of “love” and consider all the ways that you can nurture and grow love in your life and home. In week three bring out the stable or crèche with the animals in it. Light the first two candles and also the third candle in your wreath for “joy” and consider all the animals and other living creatures in our world -- the birds who surprise us with beauty on a branch, the farm animals who provide us with nourishing milk and eggs, and even earthworms who help the garden grow. Bring out Joseph, Mary, and the shepherds into the stable. Place the Magi across the room and move them slowly from windowsill to windowsill, nearer to the stable with each passing day. Light the first three candles and add the fourth candle of “Peace” and pray for peace for all areas of human conflict, including the conflicts within our own hearts. This is also a great week to make a special donation to an organization which supports peace, locally or globally. Jesus, the Child of Light, comes into the manger. Light all the candles, one by one, and remind yourself of all the hope, love, joy, and peace which has been cultivated in anticipation of this time. Light the center Christ candle, remember a baby born into a stable with only animals’ breath to keep warm and reflect on the mystery of our connections: one to another, one to the earth, one to the Light. Historically Christmas was a feast which lasted over several days. Observing these twelve holy days and twelve starry nights can be a powerful antidote to the blues which often come after the holiday rush—so stretch out time and savor it! Lighting the wreath every night until January 6, also know as Epiphany, is one way to continue to enjoy the season. * I am indebted to Waldorf educator Sharifa Oppenheimer and her book Heaven on Earth: A Handbook for Parents of Young Children for elements of the meditation I share here. Courtney Pinkerton is a holistic life coach, writer and retreat leader at Bird in Hand. She earned her BA at SMU (1999) and completed dual Masters Degrees from Harvard Divinity School and Harvard Kennedy School (2008). A mom to three young children, Courtney enjoys helping people craft home traditions which connect spirituality with green living and social engagement. Courtney lives in Oak Cliff with her husband and one-time Peace Corps companion, Richard Amory, and their family. She can be reached through her website www.courtneypinkerton.com and www.facebook.com/birdinhanddallas. Cool craft! Thanks for sharing! I like the fresh new take on the advent wreath. Lovely way to celebrate. Thanks so much for sharing this. Great craft and I enjoyed the history as well. Liked her facebook page too! This could be a wonderful family tradition! very neat craft. Love fresh pine in the house over the holidays. NO BETTER SMELL. What a great way to do something fun and teach your children at the same time. (using hubby's account) I'll bet that smells amazing!! 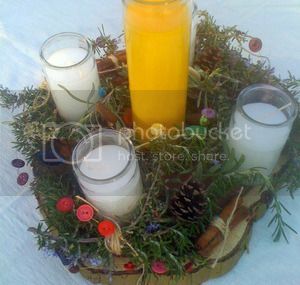 Beautiful advent wreath! Thanks for sharing how you did this - excited to make my own! Love it! I used to look forward to the advent wreath as a kid, but I never see them for sale. I'm excited to try making my own!